Welcome to our our third issue of Cloth Diaper Column for 2013! This month, we're taking about saving money with cloth diapers - and even more specifically, how you can cloth diaper for under $100! Plus we've got other news, savings, and more! Spring has sprung! Well, it's coming a little late to us in most areas of North America this year, and here in Toronto, where I live, is no different! I'm looking forward to the day that I can sun out some of our diapers and enjoy some time in my back yard again! While the weather is bad, I'm doing a little spring cleaning around the website, dusting off some of the older articles, and brightening up content with new photos and content. Have you noticed any of the changes? What do you think? If you see something you'd like me to change - please let me know! I truly appreciate all of the feedback I receive from you, my readers, as it shows that these articles don't just disappear into space after I publish them, and that really boosts my spirits! While for some, cloth diapers are a cute way to make a fashion statement, they are a wonderful way to save money too! If you can curb your fluffy addiction tendancies, you really can build a reliable, no-frills diaper stash for under $100! If you live on a tight budget (or you know someone who does) this article is a must read! 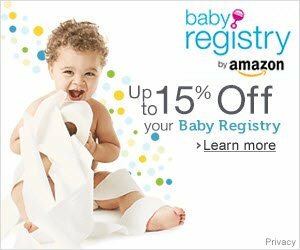 We've highlighted how you can build a stash of diapers that can last through 2 days, spending $100 or less. Get the full article here. Prefolds and covers, pockets, or even old-fashioned flats - there are truly affordable options for everyone. Sewing or buying used can save you even more. $100 is the equivalent of 2 to 4 cases of diapers, which will last only a month - but with cloth, it can easily last you through at least one child! Know someone who could benefit from this article? We would be honored if you would share it with them. Simply ﻿click on this link ﻿to send a link to them by email. 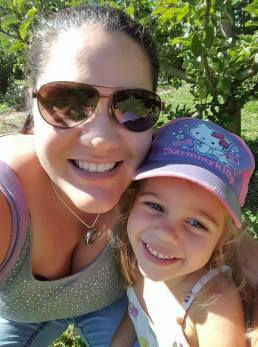 Plus, if you are diapering on a budget, please feel free to email me and let me know how you have saved money! Plus, this month we had by far our most popular post EVER on Facebook when we posted an image that said, "You can't buy happiness..." If you missed it, you can check out this photo on our website here. 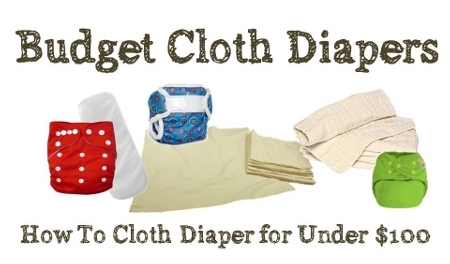 Are you going to be attending the Great Cloth Diaper Change this year? It's happening on April 20, 2013. Visit their website to find and register to attend an event near you! made with a blend of bamboo and organic cotton. These prefolds are soft and trim, and come in 4 sizes. Starting at $8 for a pack of 3 on the Grovia website. Sponsors wanted! We're planning to run our popular Made-in-Canada giveaway again this July, and are now looking for interested sponsors. If you or someone you know might benefit from the exposure this event will provide, please don't hesitate to reach out to me! This week only, unbleached birdseye cotton fitted diapers are on sale at OsoCosy for $4.49 each at ClothDiaper.com Wow, that's 40% off retail for these reliable, no-frills fitteds! 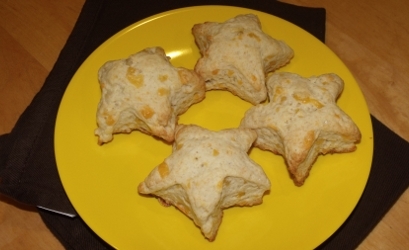 I'd love to share a family favorite recipe with you this month - cheese biscuits. I make these when I want a quick and easy home-made side dish, and they're perfect for company. They don't require tedious work with a pastry cutter since they replace fatty butter with heart-healthy oil, and you can prepare them in 5 minutes while everything else is cooking. Baking time - 15 min at 400F. Mix dry ingredients into bowl, and then add grated cheese. Stir. Add oil and milk, and stir into soft ball. Knead onto floured surface 8-10 times. Roll out to 3/4" thickness and cut with biscuit cutter. We love to use our star cookie cutter! Place on ungreased cookie sheet and bake at 400F for 15 minutes until nicely browned.